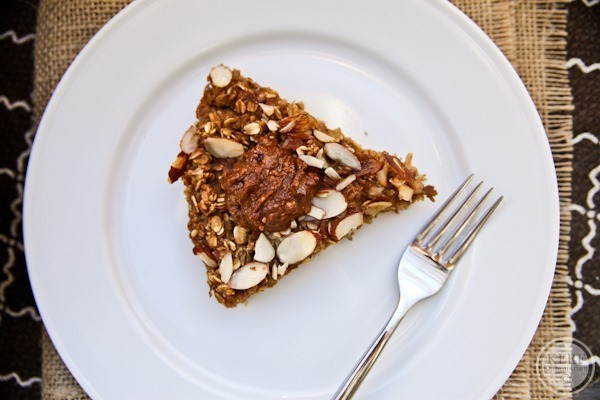 I have a great recipe to share with you today – a caffeinated twist on my baked oatmeal! But first…let’s talk about coffee!! Whether you’re like me and lean towards decaf or you love that buzz, buzz, buzz, we all have our coffee rituals and favorite beans. I got hooked on afternoon decaf cappuccinos last winter while taking Mazen out for walks downtown. ‘Tis the season. 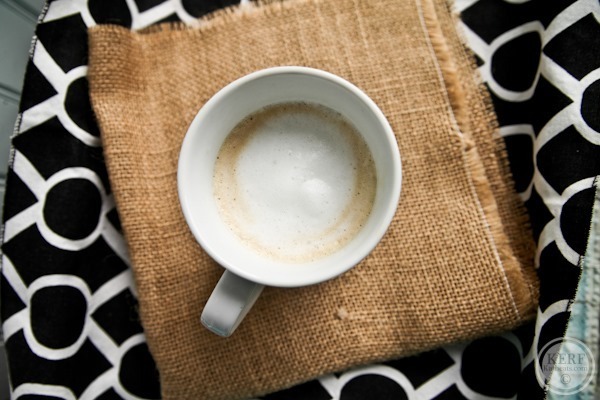 There is a cool hot new way to get the boutique coffee shop experience in your own home. Perfect Coffee, who is sponsoring this post, partners with specialty coffee roasters to bring delicious coffee from the best specialty cafés directly to you. 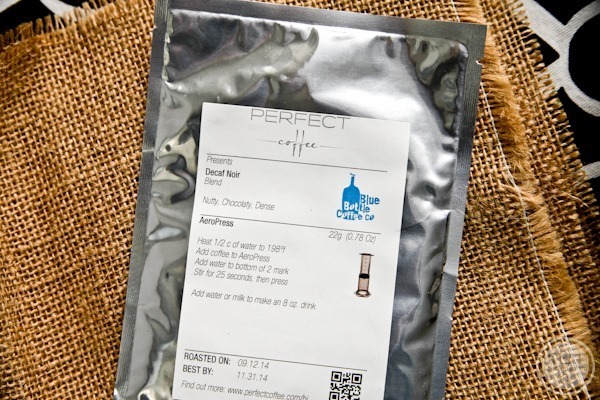 Perfect Coffee’s subscription service starts at $15 a month and allows you to choose the amount, brew style and roasters you covet. 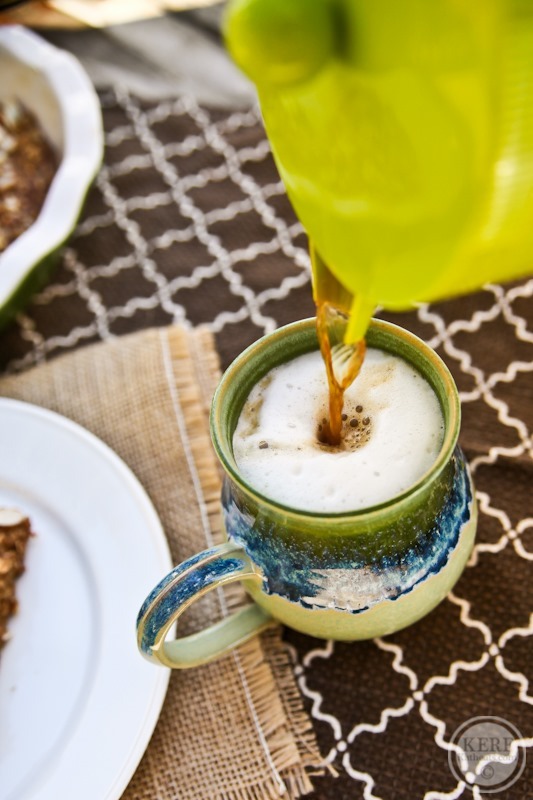 Just like you might have a house wine and a special stash that you crack open for company, this coffee is best saved for morning when you have time to sip and savor (although if you can afford it, it would make a delicious everyday cup!) If you buy a coffee at a shop everyday on your way to work, their monthly plans offer coffee at $1.88 or less per cup, which would be a great way for coffee-lovers to save some money while discovering new types of coffee in a perfect cup made at home. Your coffee arrives in small serving packets, and Perfect Coffee has developed proprietary technologies to ensure that ready-to-brew ground coffee packets stay fresh for months. I love that each packet has special instructions for that particular coffee, including temperature, time and measurements, that makes it really easy to brew the perfect cup just like the pros. This took the guess work out of the AeroPress (which I’ll get to in a sec). You can choose to have your coffee prepared for auto drip, French press or AeroPress. You can also choose the size – a single cup, a double or a “full pot” option. Here’s a list of the roasters they currently work with (lucky you if you live near one!!) Blue Bottle Coffee Co, Chromatic Coffee Co, De La Paz Coffee, Four Barrel Coffee, Stumptown Coffee Roasters, Philz Coffee, Ruby Roasters, and Equator Coffees and Teas. (I think Shenandoah Joe needs to join in, as I’m lucky to have really good coffee here too!) I savored the decafs (the Blue Bottle Decaf Noir was my fav! ), and I had the regulars before my soccer games! This would make such a great gift for a coffee lover – especially since you can try new kinds every month. Perfect Coffee is also big on proper brewing techniques and sent me an AeroPress to try. 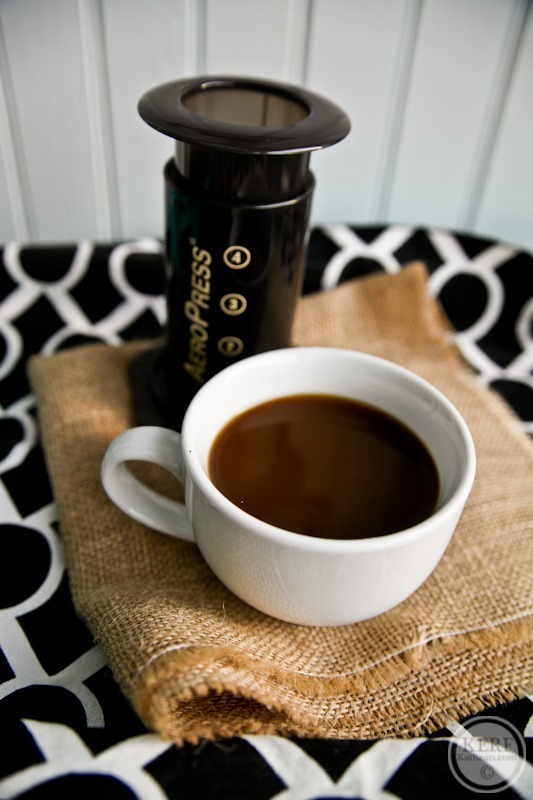 I LOVE it – it’s like the French press meets a single-cup brewer! You put in a tiny filter, add 2 scoops of grounds, pour 4 ounces of hot water on top, stir for 10 to 25 seconds and then press through into your mug. It’s also super easy to clean – just rinse the bottom. It makes a concentrate and then you either add water or milk. Adding frothed milk made an amazing latte! And finally, here’s an offer to warm you up: with the code katheatspc1 you can get 50% off your first two month’s shipments if you subscribe by November 30. Just so you know, you can cancel at any time, so it’s worth trying out. 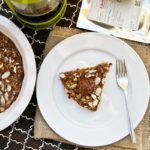 Inspired by all of my delicious coffee, I added a half cup of to my oatmeal bake recipe – minus banana and plus almonds for a nice crunchy topping! Here’s the super easy recipe! Oatmeal and coffee together make the perfect breakfast. 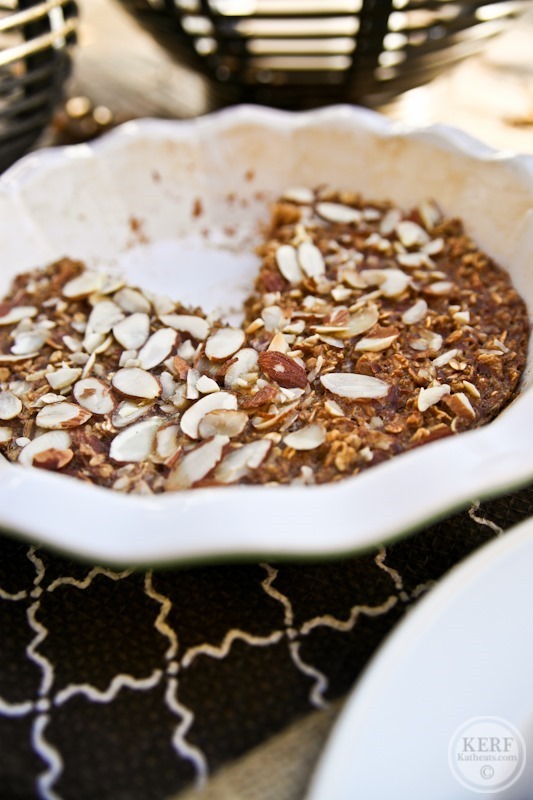 This baked oatmeal blends them beautifully. And it's great reheated on busy mornings! Grease a baking dish with butter or cooking spray. A pie dish works or a small casserole dish. Bake for 26 minutes, until center is set and top begins to brown. Now pour yourself a mug! This post was sponsored by Perfect Coffee. That aeropress looks really cool btw, I’ve never seen anything like it before! Now I’ve got something to add to my Christmas list for hubby to get me! Wow, what a great twist for coffee lovers! Now you have me wanting to go back to San Francisco. Tell me you got a grilled raclette cheese sandwich at Cowgirl Creamery! If you’re looking for something cheap I recommend the Ikea milk frother. I just warm my milk and froth away. It’s around $4 I believe. But for that price you could buy it and use that until you find something better! I’m looking into it, but does it require an Aeropress? I have a French press, but I’m unsure if the grind is the same and given the fact that French press is unfiltered. They have french press too! I saw that & ordered 8 cups! 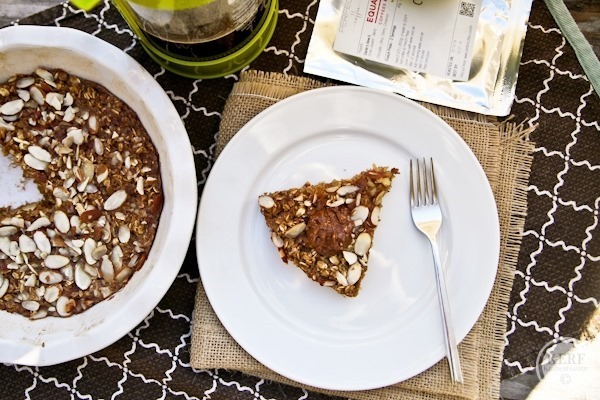 Coffee oatmeal…this is something i wish I tried before I cut out caffeine completely. I might be missing out, but having a adrenal fatigue, i can’t afford to stress them further by drinking coffee. im sure this tastes real good, and maybe I’ll try it with tea or decaf coffee. 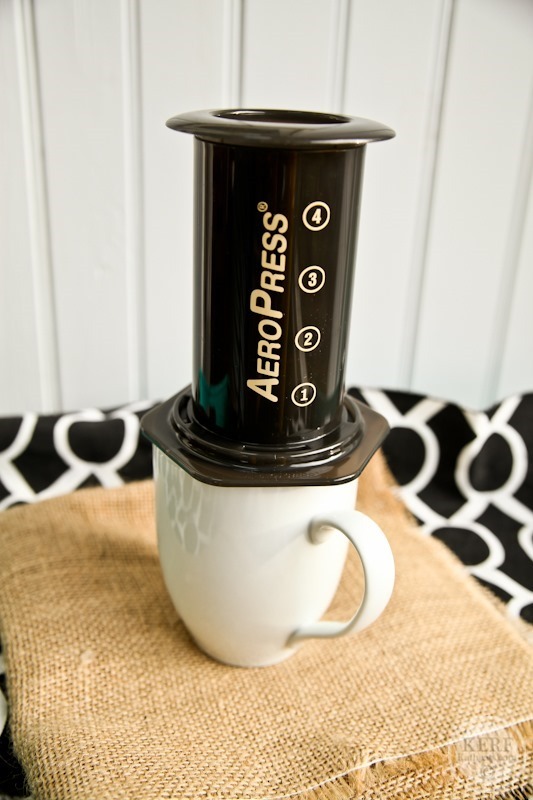 I have been dying to try the aeropress! I love french press and pour overs, so it’s right up my alley. The recipe sounds delicious! 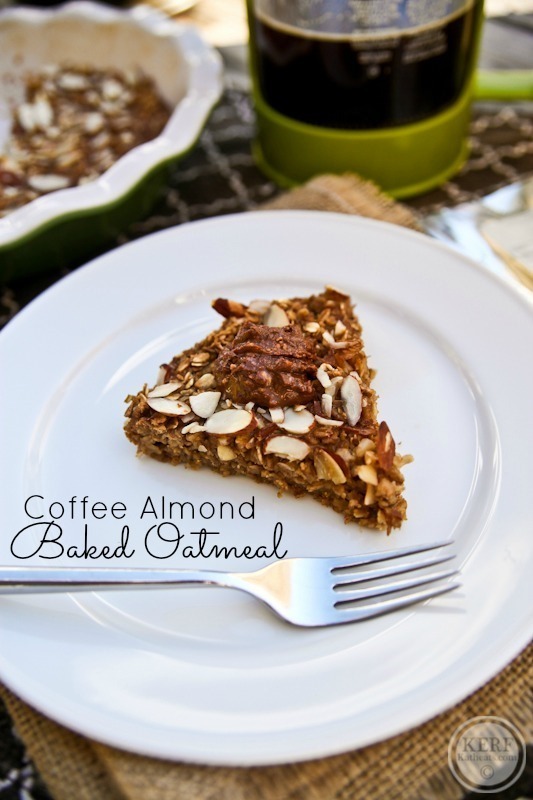 Almonds + coffee is an amazing flavor combo! These pics are beautiful. 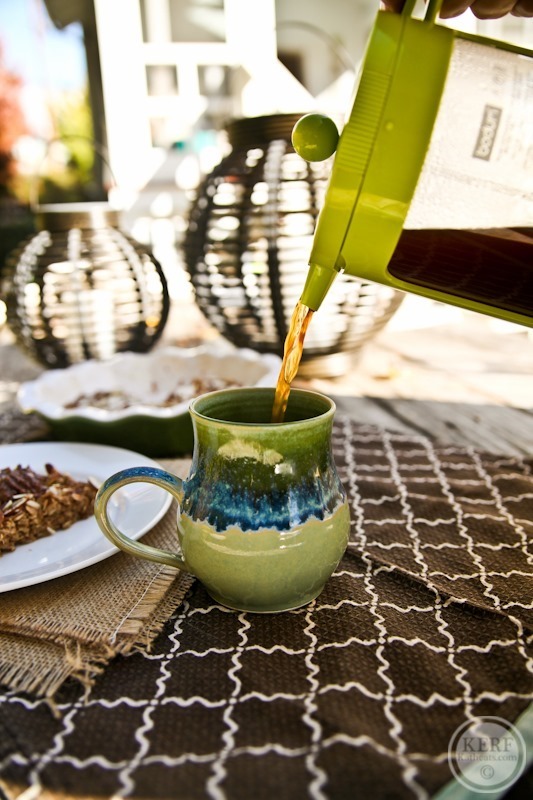 I LOVE that mug with the green french press. I’ve never tried baked oatmeal because I don’t think I’d like the consistency, but it seems so convenient. I’ll give it a try. 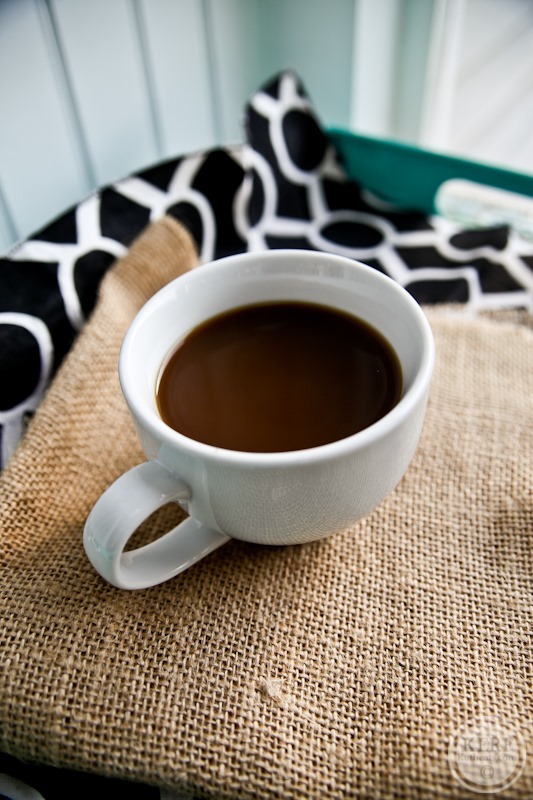 I’m not a coffee drinker but I love coffee in recipes. Weird, I know. Looks yummy. I’m going to try the baked oatmeal this weekend with chocolate chips. I made it this morning with chocolate chips and I used pecans instead of almonds since that’s all I had on hand! Delish! For those folks wondering what equipment you need for Perfect Coffee, we work really well with any traditional drip maker, or a french press, or an AeroPress (as you covered so well). I’m happy to answer any questions about Perfect Coffee here that people might have. Yummm. Just made the oats with French roast coffee, some shredded unsweetened coconut and some slivered ( in the coffee grinder) semi sweet chocolate as well as a dollop of almond butter right in the batter. PERFECT! Chocolate and coffee…can’t beat it!!! We have a little Italian coffee shop about 5 minutes drive from home, best coffee ever! Whoa. Two of my favorite things! This looks like a yummy weekend breakfast. I’m not sure I understand how the coffee company works. Do they send you the coffee and the coffee vehicle to try every month? Is it a coffee of the month club? It looks really interesting — I’d love to try it out. How does it work? It’s a coffee of the month club but you get to choose the flavors. That recipe sounds SO good!! ohmigod that blue and green mug!!! I NEED IT! Coffee, almonds, and oatmeal..all the things I love! Thank you for recommedning Perfect Coffee. It’s the perfect gift for my coffee, an admitted coffee snob. Ha ha. And it’ll work out for me too…and my drip maker. I’ve seen the Aeropress pop up everywhere around me and never looked into it but you described it perfectly. I maaay need to get one of these asap. Gorgeous pics and I’m dying for some coffee now. 🙂 How long did it take to prep the recipe, take the pics, edit, and write everything up? Bloggers make it look so easy but I’m sure it’s not! Living alone (i.e. no one to judge my meals! ), I often end up eating oatmeal for two meals a day — so I’m always looking for new ways to prepare it. The next time I have milk in the house I’ll be making this one. Thanks for sharing! Intentional 🙂 Glad you liked it! What does the texture of the baked oatmeal taste like? Is it super chewy?